Today I was reading the recently released McGraw Hill Construction SmartMarket Report on Global Green Building Trends and found myself again shocked at the massive market opportunity for green buildings in Asia, and even more shocked that more green buildings aren't being provided. According to McGraw Hill, most of the growth in green buildings in Asia will be coming from the commercial and residential sectors in the near term, with government, retail and industrial lagging behind but still expanding. I think this is powerful and shows that tenants and investors are catching on to the imperative to go green. At the US China Greentech Summit last month, Tishman Speyer’s sustainability guy, Steve Latargia, said the credit crunch will not affect Tishman’s drive to go green, saying that if they don’t build green, they wont have any tenants when the recession is over. The same trends are starting now in China and will only deepen as the market matures and more international and leading-end local tenants demand green space. This demand for green space and a relatively small supply of space in China means that owners of green real estate should start to see a premium for their space. And sure enough, Jones Lang LaSalle reported recently that nearly ~70% of corporate real estate managers are willing to pay more for green real estate in China. This also gels with what Prosper Center has seen, commanding rents 5% above the going CBD rate. And just to drive the point home, 64% of Asian respondents to the McGraw Hill survey expect rapid growth in both sales and profits from green buildings. …so what’s holding green back? 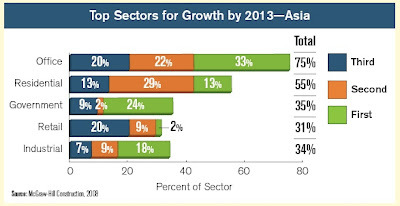 Higher perceived first costs are the key barrier to green building growth in Asia. In fact, fully 83% of respondents cited this as the key obstacle to further growth of green building. Interestingly, the same percentage of respondents cited higher first costs in America, a market that has much more experience with green construction. So this is a worldwide problem. I continue to be surprised that the real estate market cannot get over this obsession with first costs, especially because it’s wrong: a recent report by Good Energies (PDF) shows the median cost premium for 150 recently built LEED buildings was a measly 2%, while median annual energy savings were around 30%. That’s a no-brainer investment. Jim Chen of Tishman Speyer China told me they brought in their LEED projects at a 3-5% premium, which is astounding given both the lack of a green product market in China and contractors’ relative lack of experience with green construction. But second, and most importantly, this green premium is just an amorphous term used by developers and owners to resist change and learning. Most green building professionals now think of the green premium as a “tuition fee”, something a developer has to pay on his or her first few green projects while learning the ropes of green development. I bet that if you were to sift through the Good Energies data, you would find that developers who have done more than 5 LEED projects now pay no premium. As Scott Muldavin of the Green Building Finance Consortium told me last summer, the green premium is not necessarily an increase in actual hard costs of construction. In most cases, developers have been building buildings the same way for a long time and are loath to change a winning formula. When they do finally begin to build green, they find that to do so successfully requires changing this formula, and they chalk this up to some amorphous, perceived “cost”. And as a result, they don’t do it. All of this is a huge opportunity for a new type of real estate developer: one who understands integrated design, whole-systems thinking and how to tunnel through the cost barrier and doesn’t just try to tweak the old model to be “green”. With a new model, developers will be able to bring in better buildings at lower cost and outperform the tired, old real estate players who keep talking about upfront costs. This is an issue that I think will only be resolved through regulation. The reality is that with the majority of buildings in china not owned by the developer long term, there is little incentive for them to think about long term savings. Worse, as owners employ management firms who do little more than hire parking guards, no one is investing in the building. It is not like a coop where the tenants pool money and invest back into the building. tenants often only invest in what is behind their doors. So, either the owner/ occupier model needs to change, the management model needs to change, coops need to be introduced, or regulations need to be put into place. Good point on the developers lack of interest in long term savings. I think this will change though as investors become more interested in owning green buildings. Developers who build to flip have to sell the building to investors, and I think soon we will see investors starting to value green buildings more highly. Therefore, the developer will have an incentive to go green, because investors will pay more for it. I'm not sure how close this is to reality in China, but I bet that within five years this will be the case. I'm trying to look into this and will let you know when I figure something out. All this is not to say that policy doesn't matter. It matters hugely, and will transform the market much more quickly. For example, the EU and city of SF both recently passed laws requiring buildings be energy audited before they can be sold. This will be great for clueless building owners, because they'll be forced to see how energy inefficient their buildings currently are, and more than likely the companies that perform the energy audits will include tips for no- and low-cost methods to improve efficiency. I would agree that if tenant/ owners were willing to pay more for a green building, then that would drive more investment - a trend I think is occurring. Where I think this is more likely to occur is in the middle end of the market where owners are tenants rather than investors. Essentially, the owner of the apartment needs to live in the apartment and pay the bills/ enjoy the benefit for it to work. Will take 3-4 developers to make it happen, and my bet is that it happens in 1st tier markets first via Vanke, Capitalland, Soho as they have the money, the following, and will be first to see pressure.